"These are a great addition to your barbecue platter. As a side dish or as the main event, the flavour combination is a real winner, although the ingredients aren't necessarily what you would expect to combine well. But it really works and the use of the Japanese Cherrywood smoked salt, sits beautifully with the aubergine rounding the dish off perfectly." Slice the Aubergine lengthways into 1 cm thick slices. Grate the mozzarella into a bowl and put in the finely diced chilli, the juice from the lime and half of the salt and pepper. Combine all the ingredients together using a fork and really get stuck into it making sure that the cheese breaks down a little and everything is well mixed. 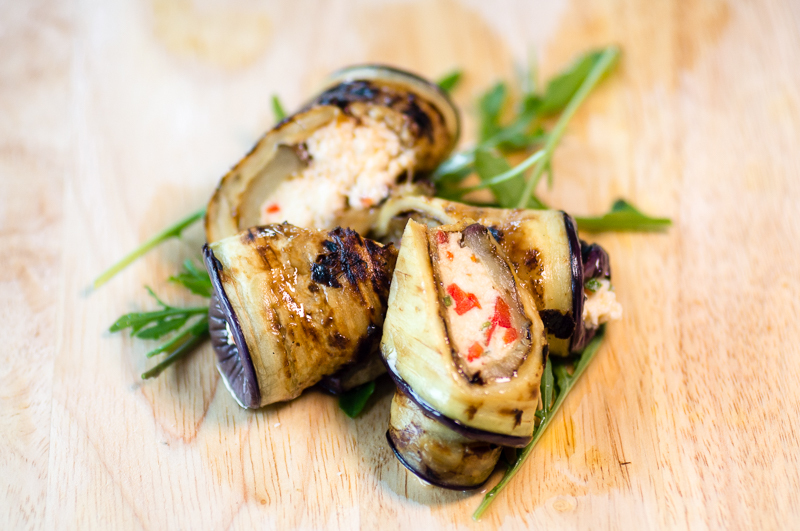 Grill the aubergine slices on a high heat. This is best done on a charcoal grill but can be done on a grill pan just as easily. The aubergine should take 1 or 2 minutes each side; it should look slightly blackened and be soft to touch. Remove the aubergine and allow to cool a little, just enough to handle but it should still retain some heat. Place about a tablespoon's worth of the cheese, chilli, salt lime mix onto the first third of an aubergine slice and then fold the slice on top of itself and start to roll. If the aubergine is cooked properly this should be really easy and you should finish making sure that the end of the aubergine slice is sitting on the bottom. Give the roll a gentle push down and this will make sure it behaves and stays in place. If you feel it's necessary you can always use a skewer of some kind to hold the roll. Sprinkle over with the remaining Japanese Cherrywood smoked salt and pepper and serve either as a side dish or with a lovely fresh tomato salad. These are best served warm with the cheese beginning to melt slightly. If they have gone cold they can always be re-heated in the oven or on the grill.